For our 250th Friday Strat feature, I'm goin' over the top! 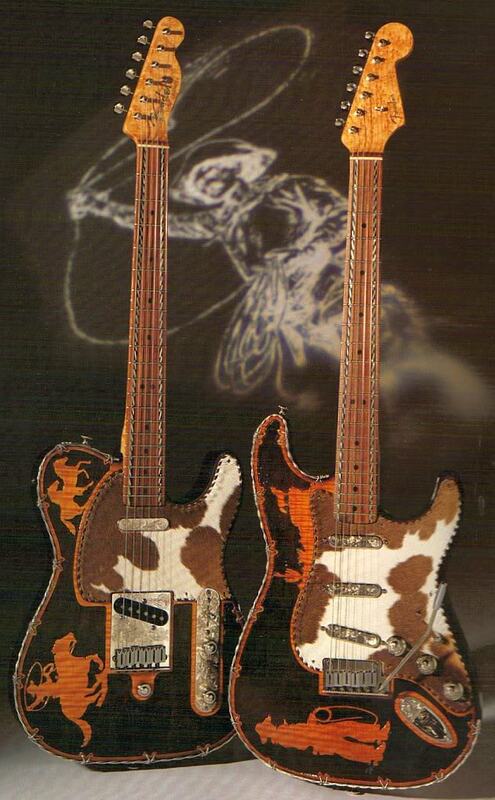 "Western Set found in the Fender Custom Shop Guitar Gallery picture book. Highly flamed maple tops with western silhouettes relief-carved on solid alder bodies. Hand-twisted sterling silver barbed wire inlay. Hair-on calf-skin pickguards, hand-engraved hardware. Bird's-eye maple necks with pau ferro fretboards and hand-twisted sterling silver inlay. "